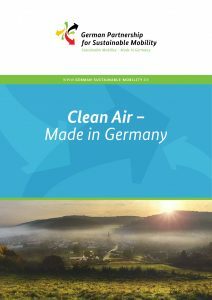 The German Partnership for Sustainable Mobility is proud to announce the publication of the updated Clean Air – Made in Germany publication. This booklet provides comprehensive information on the legal framework conditions for clean air in Germany, shows how air pollution in Germany is tackled from a planning perspective and presents exemplary measures and initiatives taken by municipalities, companies and environmental associations to reduce pollutant emissions in the transport sector. As traffic is a main contributor to air pollution, special emphasis is given to what can be done to reduce pollutant emissions from the transport sector. The aim of the publication is to present best practice solutions for the worldwide needs to fight air pollution. First published in 2015, this new version is comprehensively updated with up-to-date data and features new articles and and best practice examples. You can download the new publication here.